There are a large variety of different types of orthotics specifically prescribed for different conditions. The type of condition you have, and the details from your biomechanical assessment will influence which orthotics we would prescribe and manufacture for you at our orthotic clinic in Hamilton, South Lanarkshire near Glasgow, and our Glasgow city centre biomechanical assessment clinic. Our orthotics are fitted and finished whle you wait in our on-site orthotic lab, servicing the Glasgow and West of Scotland area. Information is provided below on some of the orthotics we may prescribe for you. Fucntional foot orthotics (FFO's) are probably the most common type of prescription orthotics. 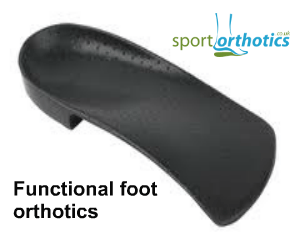 These orthotics are used for biomechanical problems which are relatively easily controlled. They do this by persuading your foot to work within "normal" biomechanical limits. In normal biomechanics the foot will roll in (pronate) and out (supinate) to allow the foot to work efficiently. in many biomechanical problems. They can be 3/4 length or full length with various designs, wedges and cushioning dependant on the individual patient needs. Heel cups are used for more significant biomechanical issues or feet that require more significant control. Some examples of these are severe over pronation, or arthriitis. A heel cup is designed for issues where the proantion and supination of the foot needs to be significantly controlled. This is where a foot that is painful on movement due to a significant injury or wear and tear e.g. arthriitis. They are made from plastic and control the foot very firmly. However, they can have cushioning to provide some shock absorption. 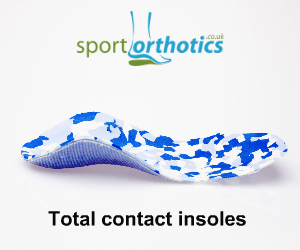 Total contact insoles are designed to follow the shape of the foot very intimately, and are especially useful for the high arched foot or under pronator. The "exact" fit means pressure areas are reduced when wearing these particular orthotics. These are made using either a plaster cast or laser scanning (CAD CAM) and are made from EVA (foam) of different density to either control or cushion the foot. They would be wedged and padded as required to control the biomechanics of the foot.